Aloe vera is a moist plant species which grows in tropical climatic conditions across the globe. Aloe vera is generally cultivated for food, medicinal and cosmetics uses. Aloe vera extracts find wide applications in medical and food & beverages sector. These extracts are used to produce aloe vera drinks and food in with the purpose to minimize the burden of diseases. The demand for aloe vera extracts is growing in food and beverages industries across the globe owing to its cost effectiveness, availability and growing consumer preferences for aloe vera products over flavor essence products. Rise in aging population and growing prevalence of skin ailments, cardiovascular diseases among elderly population are increasing the consumption of aloe vera products so as to maintain health and fitness. Population across the globe is mounting consumption of aloe vera juice due to rise in preferences of aloe vera products owing to presence of flavored drinks, which grows in importance among consumers. Aloe Vera juices made of aloe vera extracts and pulps have several health benefits and come in different flavors further growing demand from the population with the purpose of cure and to overcome the deficiency. Apart from this, significant growth in food industry to develop effective and taste rich aloe vera juices for the consumers is likely to gain traction in near future. Moreover, increasing strategies from emerging distribution channels across the globe is driving the growth of aloe vera juice market. The global aloe vera juice market accounted the largest revenue share in 2016 of overall aloe vera extracts market across the globe. Moreover, the market of aloe vera juice is anticipated to register a promising CAGR over the forecast period i.e. 2017-2024. Asia-Pacific is estimated to be the most adaptable and revenue spawned region in aloe vera juice market during the forecast period i.e. 2017-2024. The aloe vera juices consumption has grown significantly in Asia-Pacific region on account of rising awareness towards the health benefits of aloe vera extracts, rising concern towards fitness and adoption of healthy drinks. Increase in aging population across the region is expected to be a major growth driver for the industry of aloe vera juice in near future. The demand for aloe vera juices are growing on the back of increasing geriatric population coupled with higher risk of digestion, cholesterol and diabetes problems. Growing awareness towards health benefits of aloe vera juice among the population and rising health consciousness in urban regions are some of the key elements which are expected to bolster the demand for aloe vera juices over the forecast period i.e. 2017-2024. Likewise, ease availability of aloe vera juice in various flavors at low cost and rising advertisements through numerous distribution channels are likely to gain traction of consumers towards aloe vera juice in near future. 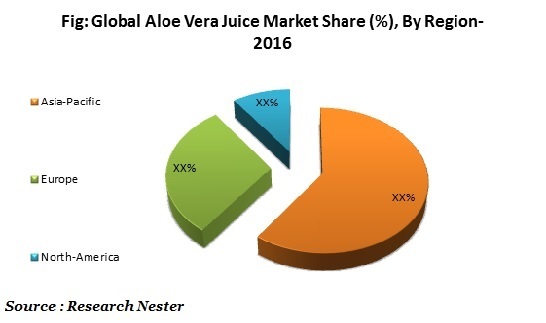 Furthermore, growing concern towards health and fitness, increasing awareness regarding recovery from vitamin deficiency and rising adoption of functional and healthy drinks in urban regions across the globe are some of the key factors expected to propel the growth of aloe vera juice market. Apart from this, aloe vera juices are observed as convenient way for treatment and consume health supplements to minimize the deficiency, expected to spur the demand for aloe vera juice substantially during the forecast period i.e.2017-2024. Conversely, lack of awareness of aloe vera juices and their health benefits among the population, availability of different substitutes and presence of unfortunate taste are some of the factors affecting the growth of aloe vera juice market globally.